From our humble beginnings as a small, single distribution operation in Odessa, today, Standard Sales is one of the largest beer wholesalerships in the United States, employing more than 500 people in administration, receiving, warehouse, sales and customer service. Our legacy began when Ted G. Roden founded Standard Sales, remaining chief executive officer and chairman of the board until retiring in 1984. While his leadership created the groundwork, Ted believed company success depended on good people – and he always insisted on the best. He also cultivated a culture of open communication and transparency, creating a positive environment, focusing on recruiting and retaining employees that shared his vision of success. More than half a century later, his philosophy still drives Standard Sales, and through its executive management team, recognizes the importance of motivated, innovative people driving his vision of continued growth, development and accomplishments. Our team also encompasses our partners and suppliers. We are committed to maintaining our close association and partnership with Anheuser-Busch, Inc., and our numerous supplier partners. 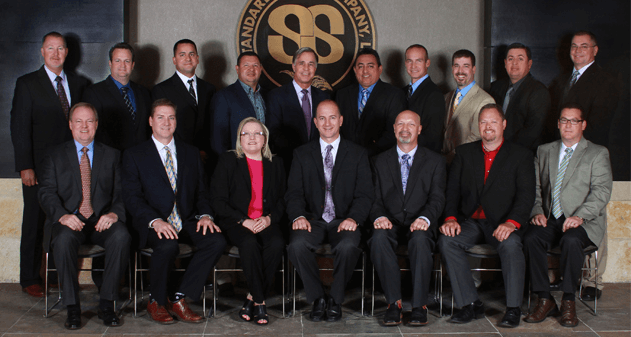 Standard Sales is extremely grateful for their support, enthusiasm, dedication, and individual contributions and assistance that sets us apart from other distributors. For more than 60 years, we have proudly distributed only the finest beer, mixers and beverage labels. Thanks to Ted’s vision and philosophy firmly based in teamwork, our legacy continues – and we are honored you are a part of our story.